I love the mutt e-mail client, it has a level of automation and configurability unmatched by any other e-mail tool I've used. Not to mention being able to compose messages in vim, always a critical capability for a useful e-mail client. As is labeled on the tin, this will sort any newly updated threads by last date received instead of the date of the first message, so newly updated threads are not missed. I found this helpful tip at https://inodes.org/2008/04/14/sorting-in-mutt/. One of the pitfalls of data science is bad source data. I noticed a particularly egregious example at https://www.debate.org/opinions/can-torture-be-justified-as-an-added-form-of-punishment today. 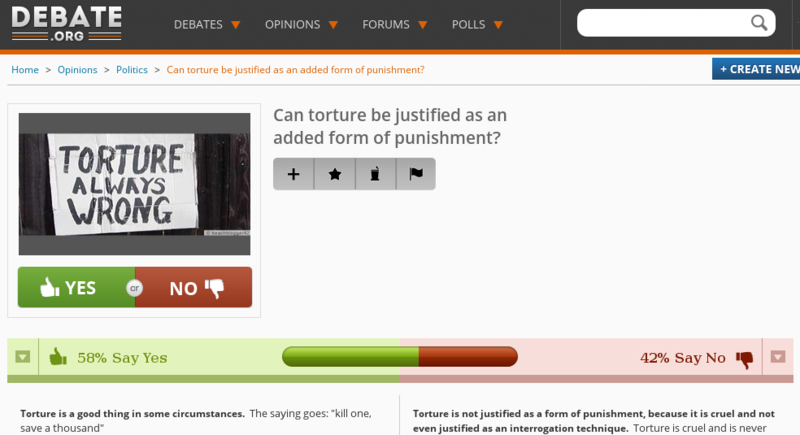 Notice the actual question on the right "Can torture be justified as an added form of punishment?" versus the image above the yes/no selection, "Torture always wrong" and their placement. Beyond this being a study in bad interface design and the image itself introducing bias by the designer, which one is being answered by what percentages of those seeing this page? Should the results of this survey be trusted? What if this was to be used as part of a data aggregate by a public policy maker to make a decision? Bad data of this nature can become terrifyingly influential as we rely on increasingly complex automated data tools to make decisions. Encountered an excellent video explaining how the world really works this morning; an excellent summary of social studies in a less than 20 minute lesson. People do what is in their own best interests, and our governments reflect this reality. Government that is good for the people happens only when keeping the people intelligent and productive is good for the government. Yesterday I attended my first in-person motorcycle race as a spectator at the Gratz Fairgrounds in Gratz, PA. This is a cinder flat track which makes for an exciting, if a bit dusty show. There were racers there of ages from 4 to 80, racing everything from highly customized dirt bikes ideal for the track to barely customized street bikes with dirt tires with engines from tiny 50cc 'chainsaws' up to big heavy harley motors. Racing was held by Baer Motorsports, which has other races on its schedule this year but nothing like Gratz. At only $5 per person and with racing running from 11:00 until 19:00, this was a great show. Definitely looking forward to going to this one again next year, with better camera equipment. Had an interesting discussion today in which a few points on Java came up. My primary focus has never been Java exclusively, so I am far from an expert, but I have been working with Java more extensively in the last few years with the Hadoop stack. Explore the variety of Map implementations. I usually reach for HashMap when sometimes I should be thinking about the other Map types. Lots of other goodies to review there, when doing development with a 'get a project done' focus it's easy to forget these basics, there's a bunch of other interesting Java collections topics in the sidebar there too. There are different reference types in Java which affect garbage collection. Many Java implementations make heavy use of object and object factories, let garbage collection throw away some of the extra stuff you may not need in your implementation. In the fun with threads category, the volatile keyword. As the author at the link succinctly puts "poorly documented, poorly understood, and rarely used." Avoid reliance on a changing global variable when using threads, use immutable types. Related to this is Java's Atomic classes, another construct to allow simultaneous access among threads to common values. These can provide efficiency gains in advanced use cases, but in general really think, read about, and consider safer alternative patterns before using. Lake Hope was low on Rebel count this year; saw lots of Harleys, a Vulcan, a BMW, but no other Rebels. 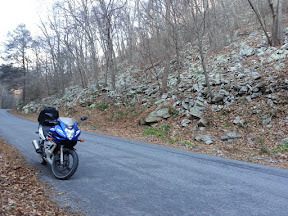 Since I was alone I was able to do more riding than I ever had out there; including plenty of runs on the Zaleski Roller Coaster and many of the interconnecting back roads around the park. Found a lot of new attractions, but I don't want to spoil them here in case I want to use them for future ride destinations. Nothing beats seeing them in person anyway, and the incredible twisty roads to get to them in the area are most of the fun. I did miss Guba's chili, the group camp fires, and some of the adventures and social opportunities being there which are only found with groups. I ride most of the time alone because I generally like it (Lake Hope rallies past are actually the only group rides I've ever been on), so I'll keep going to Lake Hope if no one else does; but meeting someone from the forum every once in a while would be nice. Since no one else came, it may be safe to say this rally is "dead", and it's more "Lex and BOB's Lake Hope Vacation", but we'll see what happens next year. I didn't want to presume to 'take over' this year as I wasn't sure if there was planning going on via some other medium, but since it was just me I will assume next year I'm in charge of planning and advertising, so I'll do more to get the word out and set some official meeting locations, times, etc. so those who want to come are more clear there will be something to arrive to. Interested in attending next year? Watch for future rally announcements at Honda Rebel Forum and Honda Rebel Unofficial Rebel Forum. Getting back into bicycle riding as I work on getting into shape. My bicycle needed a rear tube replacement and a good cleaning to remove the cat hair from the gears. 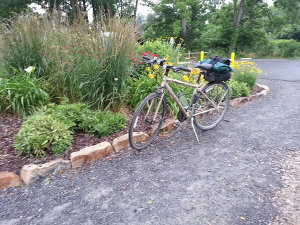 As a 'return to cycling' event and a July 4 adventure, Christine and I rode the Buffalo Valley Rail Trail on Monday. Only the ends are paved, but the packed gravel in the middle is reminiscent of the lane at home, so it wasn't uncomfortable. Although at first I felt my bike was a little stiff for gravel, by the end I realized it was the rider not the bike that was stiff. A beautiful ride in the country with farms and fields on either side and gentle slopes, even for a rail trail. We rode in light rain and mist on the return leg, but my gear kept me dry and it proved rather refreshing. Longer than I expected; about 10 miles each way, as they finished more parts of it than when I had investigated it in the past. 20 miles was probably a bit more than I should have tackled after having not ridden in years, and led to being quite sore this morning. After years of using an otter case on my Samsung Note II phone, figuring it was near the end of life and wanting to enjoy a slim phone for a while before retiring it, I started using it without the case. I enjoyed having a phone that actually fit in my pocket, but alas the inevitable happened, I dropped it and the screen broke. This older phone still fit my needs however, so I was loathe to replace it. I've always wanted to tear one of these apart, so instead of throwing it away, I decided to replace the screen. Replacing the screen on these isn't particularly easy for the unexperienced. There's many small parts and screws, the components are sensitive to ESD, and to get a good job without wrecking the case proper tools are needed. Fortunately I'm an N scale train hobbyist; these have similarly sized components and similar issues dealing with tiny electronic components. 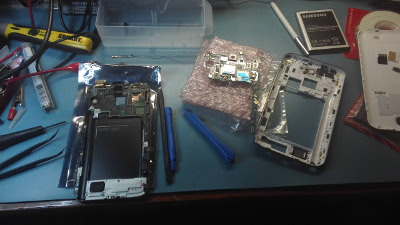 Ifixit has a guide for replacing the screen on the Samsung Note II which I used as well as an order page for the various parts. It actually works the first time, I have no extra parts on my workbench, and my new screen is unbranded, which is a rather cool side effect of the surgery. Riding in to work last week I picked up this stowaway. I heard a noise when I hit it, then after riding a few hundred feet, came to a stop sign. When I pulled out from the sign, the back end felt slightly mushy and I started hearing a ticking noise as I began moving faster. I changed road position, thinking it was the road as the stretch I pulled onto was under construction, but in the course of turning I noticed the back end was very mushy, and it dawned on me what was going on. My first flat tire on a vehicle. Pulling off towards the side of the road as far as I could, I looked back and saw this nail sticking out of my tire. Unfortunately I was at a bad spot where there wasn't a berm to park in. After assessing the situation I decided to move the bike at a few MPH up a driveway to a storage facility where I could safely park and wait for help. Waiting a while in occasional rain, contemplating how it had been a while since I had time to just relax and watch the rain, I was able to arrange a ride home then come back for the bike with my trailer. Loading proved to be a challenge on a wooden tilt bed trailer; my rear wheel skidded off when I tried to go up. However, there was a location with a pile of stone where I was able to load with some strategic parking and riding. Looking for a way to unload the bike off the tilt bed safely, I ended up buying a patch kit, cutting the nail out with bolt cutters, patching the tire, then inflating it. 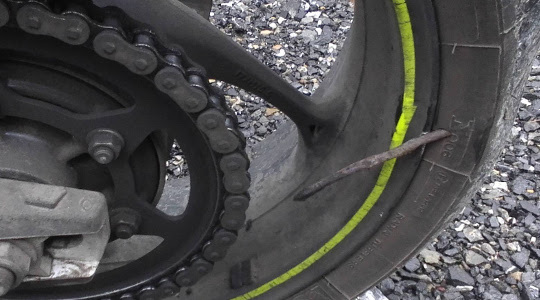 With sidewall damage like this, there was no permanent fix for the tire, but this was enough to get the bike in my shop and remove the rear wheel. YCH examined the wheel when I brought it in and determined the damage was cosmetic. With a new tire, the bike is back on the road in time for the Triumph rally in Oley and I have a new experience to add to my motorcycling repertoire. Having experienced many motorcycles by now, I still hadn't ridden a Harley Davidson. Generally their price is exorbitant and their reputation for quality is poor. Although typically thought of as behind on technology, they are one of the only companies selling mid-size cruisers with ABS brakes, a strong part of a purchase decision for me. In this case it came down to a Triumph Thunderbird ABS or a Dyna Switchback ABS. Both were similar in price (albeit the Triumph was new, and the Harley gently used), the deciding point came down to a review which actually rated the Harley higher; rare for this magazine which frequently lampoons Harleys. Reading about the Dyna; with a rubber mounted engine for the famous Harley vibration, and arguably the best handling of Harley's bikes, it seemed a great choice for me. On a technical checklist basis, the Harley is inferior in nearly every way; crazy weight and balance, shaking, short service intervals, the frustrating bag mechanism, proprietary tires, the checklist goes on. It leaked oil on the ride home, which got me thinking 'oh boy'. The saddlebags had a locking component which appeared to have been broken by the vibration; this specific bike is a bit famous for the bags coming off. I believe this locking mechanism breaks as the locking pins are on a cast part, and if undetected for too long the bags jiggle off. It turned out the oil was overfilled, which is apparently common by Harley dealers. Once the oil level was adjusted, it no longer leaks a drop. I replaced the broken saddlebag component, time will tell if it happens again, but now I know what to watch for. As I do my own service work, the short service intervals shouldn't be a big cost for me. 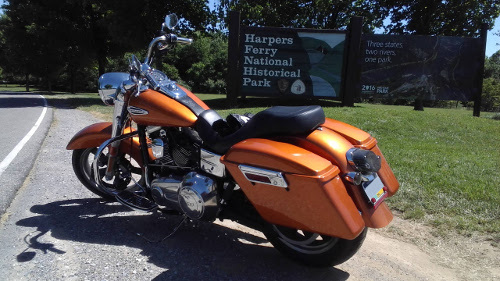 On this four state all day tour to Harper's Ferry, I rode it long enough to get used to the shaking and certainly loved the journey. The experience reminds me of the 1952 Ford 800 I have versus my Kubota B3200. Modern Kubota is more practical in every way, and it's what I reach for to do real work, but the Ford has character all its own. I'll give and get a fair shake from this bike, and use experience to determine for myself if I like the brand. Heated gear is something I have avoided in the past, even though I ride year around. Smaller bikes I enjoy most don't have the alternator output to power it, and the battery powered options aren't suitable for my ride length and frequency. Cycle Gear had a sale on heated gear this winter, and I now ride the Kawasaki Voyager 1700 most frequently in cold weather, which has plenty of electrical output to spare, so I decided to try a vest. Keeping my core warm with a vest certainly extends the amount of time I can ride below 40F; typically on the one and a half hour ride to work I would need to stop once when in the 30-40F range, twice in the 20-30F range, and sometimes four times below that to walk around and warm up appendages. With the vest I've been able to ride straight to work without stopping. However, although I didn't have too much trouble with my hands before, now with the vest and the longer range I am riding without stopping, my hands were the next target for heat. The Cycle Gear vest has matching glove liners I then purchased; this solved the cold hands, however these do have an annoyance. I expected them to be controlled via the same controller the vest has, however they seem to go full heat whenever plugged in, ignore the controller, and don't shut off until unplugging. This works fine below 30F but tends to roast my hands after a while above that, with the only way to shut them off being to unplug. Fortunately the connector is rather easy to just reach down and remove; although I do have to stop to plug back in. Now as I'm able to do longer rides without stops, my legs and feet are starting to get a bit chilly . . . This has been a particularly mild late fall so far, offering many riding opportunities. These late fall rides offer unique views not available in the more temperate seasons, without having to deal with the extreme cold of winter. Defoliated hillsides provide wonderful views of rock faces not normally visible. It becomes possible to look through hilltops to the vista's beyond, many of which are otherwise impossible to reach. It is a great time of year to ride on those narrow back country single lane pavement and packed dirt roads, as normally the dense trees along many of these roads are particularly effective at blocking the view. Slower speeds involved on such roads allow longer riding times between warm up stops. Care does need to be taken as such roads are poorly maintained, particularly an issue if it is below freezing and/or the ground is frozen, which makes these roads a better late fall choice than winter. The annual Lake Hope Rebel Rally was held September 11-13, 2015. To ensure I would be there early, I planned to head out September 10. Unfortunately, storms in my area made that idea unpalatable; although I often ride in rain, I don't find hours riding in thunderstorms to be inside my acceptable risk profile. Fortunately it cleared up on Friday the 11th, so I headed out at my usual time. It was a gorgeous ride out with clear skies and nice weather; until I got within a few hours of Lake Hope. As I approached it became clear storms and rain were prevalent over the park; a particular issue for someone planning on setting up a tent, compounded by the fact that it would be both raining and dark when I arrived. I contemplated the idea of camping to the east where it wasn't raining, but the forecast made it clear that wouldn't help as it would be raining Saturday. So for the first time on one of these trips, I stayed in a hotel in Parkersburg, WV. It was still raining in the morning, but with daylight to ride, in I proceeded to Lake Hope. When I arrived I didn't find any Rebels; it turns out I missed the pack leaving by 50 minutes. After enjoying a fine meal at the lodge and generally puttering the park around for a few hours, the rain finally relented so I headed to my campsite to set up. 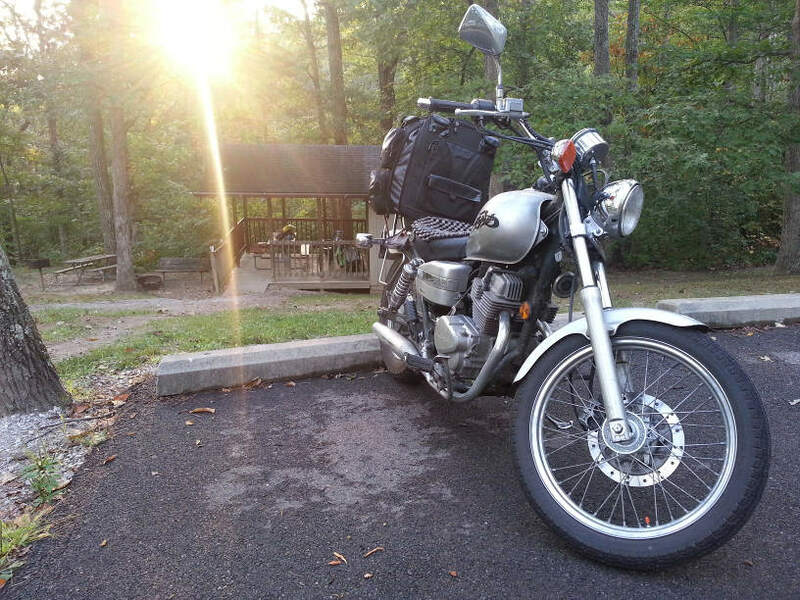 Afterwards, I went for a ride to Ash Cave, a few trips on the Zaleski roller coaster, and a few of the other wonderful motorcycle roads around the park. By then evening had arrived, the party had returned to the cabin area and had a campfire going, so I joined in. Although the party was small; the rain had scared off most of the riders it seems; there was plenty of fun conversation and Guba's famous chili to enjoy. Sunday we enjoyed Lake Hope Lodge's breakfast buffet which includes their delicious brisket. Afterwards, I hung around the park, explored the campground and some trails around it. Guba stopped by with a large pile of firewood, and B.O.B. the bear. After dark, DNC stopped in and we enjoyed a fine campfire on a glorious clear night full of stars; a fun change from year's past where I'm usually the only one still there. B.O.B. 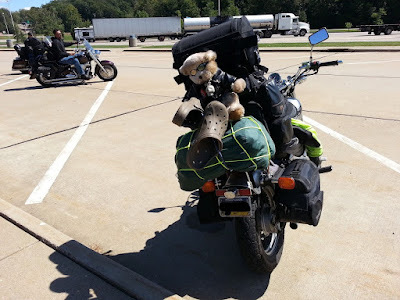 the bear (shown in the picture) has been riding around the country on Rebels for 10 years. Apparently I was the only one at the Rally who hadn't ridden with him yet, so he accompanied me on the ride home. Now to plan some trips with B.O.B. before I hand him off to the next Rebel rider . . .